The days of the embarrassing gas passing in public is numbered, so we hope. Not really a 'first' as smell-neutralising undergarments have been around for a while now, but this one is claimed to be the best yet at doing the task. This should be good news to people with issues of unwelcomed odours - flatulence, feet smell, sweaty armpits, old age smell, etc. Underpants which are claimed to neutralise the smell of flatulence are proving a hit in Japan, whose hard-working businessmen seem to like the idea of breaking wind without getting rumbled. A Japanese textile company has developed a range of underwear which it says prevent unwelcome odours. 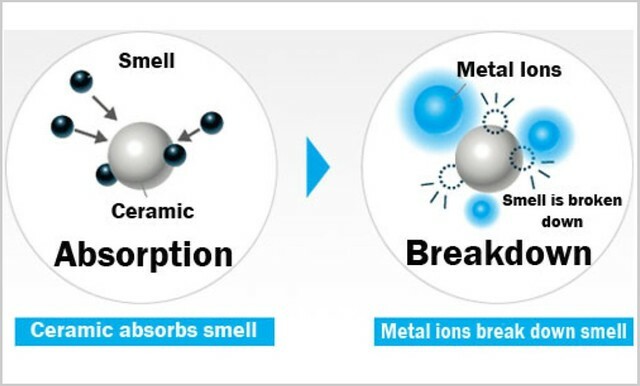 "It took us a few years to develop the first deodorant pants that are comfortable enough to wear in daily life but efficient in quickly eliminating strong smells," said Nami Yoshida, a spokeswoman for the company, Seiren. "At first we thought about selling them to those who require nursing care and to hospitals. "But to our surprise, lots of ordinary people, like businessmen who are in positions that require them to see people on a daily basis, bought them," she said. The underwear is manufactured with whiff-absorbing ceramic particles in the material fibres. Inodore explains how the revolutionary fabric works. This is good but I believe we need a few hundreds to purchase this. Gosh, must be one of the best invention of the century..LOL.. A boon for those with BO issues and people can now safely pass out the 'wind' without the embarrassing smell. or approximately RM122 if you order from Malaysia. Not sure if it's going to be a boon but it sure is a great option for those in need.